At the end of the century all kinds of elections of ".... of the century" are being organised (You want to elect the Bugatti of the Century as well?) The British magazine Motor Sports did one of racing drivers in their November issue. At No.1 was elected Tazio Nuvolari, especially because he did win quite some races with material which was inferior to the cars of the competition. Mentioned were especially his successes on Alfa when the Germans dominated racing at the end of the thirties´, but of coure he did likewise things at the wheel of Bugattis as well! In 1950, I bought an aluminium bodied Bugatti four door convertable pheaton Bugatti from a person (a group of teenagers) in Patterson N.J. The unusual feature was a small fin which protruded from the trunk lid. Sadly the engine had been removed and replaced with a Ford V8 60. The original engine came with the car but had a cracked block. I sold the machine about six months after so I don't remember. Because I was a poor teenager I couldn't afford to restore it. I have researched many books and never seen or found that particular model. The upholstery may have been Soskish (my spelling may be way off) but one panel had his typical trademark compartment. It would be interesting to learn if there is anyone knows about that particular car. I have seen many books about Bugatti but nothing approaches it. It wasn't the most stylish car that has been created. Horseshoe fenders, louvres all over the hood, cycle fenders and then a rather bulbish washtub body ending in a slanting boot with a curious fin in the lid. The car had the last vestiges of it's original blue colour and the aluminium body was poking out where there wasn't any paint. The upholstery was almost gone and the top was a joke A collage of bracing and canvas not particularly attached to anything. Ahh youth. Born in Feb 1934, I grew up in a little town of Montvale, N. J. which is a smallish town ~ 25 miles from New York City. The period after the war in the U.S. was very interesting because many people had put away their cars for the duration of WW II. After the war they didn't want those "old" relics anymore. That's how that beautiful Bugatti Royale got into the junk yard and was found by the right person to restore it (or so the story goes). I worked part time for a garage (sweeping and cleaning mostly) for a man from Germany who was almost legendary at being able to fix some of these almost unheard of machines. We were still in a fixing era rather than restoring. Occasionally he was called upon to go to Tuxedo Park, N.Y. and tow a machine to his shop for repair. One time it was a gigantic Minerva, the next a Reo Flying cloud and once a Dobel Steamer. It was all these facinating machines that caused me to buy and own for a while a few nice machines until I found they were better suited for motor museums than to be driven. The Bugatti I mentioned was one of these and it always preyed on me why was it made, who had preciously owned it and what happened to it. I would be disappointed to learn that it has vanished. Still many exotics have. Can anybody give me any details? Thanks. Volkswagen presents the FOURTH Bugatti at the Tokyo Motor Show! The EB 18/4 Veyron shares platform and Mechanics with the EB 18/3 Chiron, however, this is the first car which was not designed by father and son Giugiaro from Italdesign, but by Hartmut Warkuß (Head of Volkswagen's "Center of Excellence Design") and his team. Must have been quite a challenge, after designing Golf and Bora! The car seems much more aggressive then the EB 18/3 Chiron, and of course does not show any familiarities with EB 118 and EB 218 studies. This is an attractive aspect of the EB 18/3 Chiron, which does show characteristics of the two earlier designs. Personally I do like better the way the Horseshoe Grille is blended into this EB 18/4 Veyron, than it was ever done for the three earlier designs. Of course everybody has to see for himself!! Engine: W18 of 6.3 litre capacity, 72 (!) valves, four wheel drive. From Christopher Gardner I get confirmed that Volkswagen did buy another Royale (confirmed by the ABC register) on October 17. It concerns the double berline. Through Marcel de Lange I heard that the Monaco Racing Team, of Gildo Palanca-Pastor racing fame, is really building a couple of EB112´s, on ready EB112 chassis they bought from the Bankrupcy of Romano Artioli´s venture. would be nice to see a few more of this wonderful automobile riding on the roads!! At the recent Bugatti festival in Molsheim, I was near the château St Jean, where the Bugatti family lived. I was able to make the photograph above, showing clearly the intent Volkswagen has to restore the building. I also heared they were to restore old, existing parts of the original Bugatti factory at Molsheim, which is next to the château. Volkswagen sponsored the event partly, and showed their latest buy, the T41 Royale Coupe de Ville by Binder, here shown at the current Messier-Bugatti factory site, side by side with the replica Esders, the one from the Schlumpf museum at Mulhouse. At the Brooks / Tajan uction held in Paris, September 6, a T49 Torpedo was sold for FF436,000 (approx $ 70,000). The body was made in the 80´s replacing the original saloon. 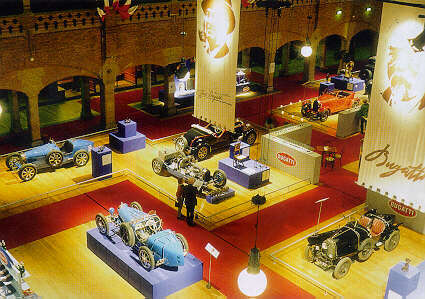 I just received a mail from Bas van de Haterd, saying that Bugatti is to be back at Le Mans in 2002!! Hopefully with more success than last time!!! Bugatti could make a return to the Le Mans 24 Hours within two years. Volkswagen, the parent company of the famous marque is thinking about using the name of the double Le Mans-winning manufacturer when it takes on sister marque Audi in the endurance race. VW boss Ferdinand Piech is keen to enter Le Mans and has already said he would like to take Bentley back to the race early in the next millennium. A decision on the VW Le Mans project is expected soon, with some suggesting that it has already been made and the only debate is whether to enter year or 2001. At the IAA in Frankfurt, Volkswagen recently presented the 3rd model within one year! It seems they are really serious! The car seems to somehow fall in with the earlier presented EB118 and EB218, I do not really dislike it! Take a look, and think for yourself. The Bugatti 18 / 3 "Chiron" is a mid-engined sportscar with the famous 18 cylinder engine, a further development of the one in the Bugatti EB 218. the Capacity is 6,3 Liter, power 408 kW / 555 PS and torque of 650 (Nm). The body is of Carbonfiber, the car is 1150 Millimeter high, and 4420 mm long. At last weeks Bugatti festival in Molsheim I tried to confirm the latest news about Volkswagen having acquired two Royales. Actually I asked the man at the wheel of the Binder coupe de Ville. 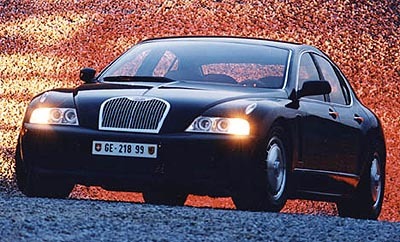 This is the car bought by Volkswagen, the only Royale. They did buy another Bugatti though, a replica T57SC Atlantic (by Eric Koux), The one that was shown at the Bugatti exhibition in Amsterdam. This seems logical, as they used the famous "fin" in all their models presented so far! Volkswagen sponsored this years event, held everey year to commemorate Ettore´s birthday. A report can be seen on their pages: www.bugatti-cars.de. There were some 60 or so Bugattis present, ranging from a type 10 to a EB110, the event was held at the site of the factory, at Messier-Bugatti, which makes aircraft parts now. It was a great sight, especially seeing two Royale´s (the replica Esder´s roadster was also there!) driving one behind the other!! The following day I saw two more Royale´s at the Schlumpf-museum at Mulhouse. Volkswagen also bought the chateau, and are really busy restoring it, as they are with an old part of the factory. September 4, 1999 Volkswagen acquired two Royale´s! VW has purchased the Binder Royale and the Berline Royale. They have also purchased the entire Bugatti Chateau in Molsheim and have erected a sign in front of it showing their plans to restore the property. Chris also heard a rumor that they will build 50 Replica 35B's , like the auto-union project that AUDI did, and use these 50 GP cars in a prize money racing series. June 3 and 7, 1999 Volkswagen´s plans with Bugatti! There will be a new factory in which VW is to invst 100 million DM, about 200 employees. This fall a new sportscar will be presented in Frankfurt ! You see, quite some news! March 14, 1999 New Bugatti presented at Geneva! With the Bugatti EB 218, the Volkswagen Group is presenting a new and fascinating vehicle at the Geneva Motor Show 1999 - a vehicle which will set new technical and aesthetic standards. The EB 218 follows on from the design and technical standards of the EB 118 study, which was shown at the Paris Motor Show 1998. The EB118 was produced by Giorgetto Giugiaro / ItalDesign under contract from Volkswagen and has been further developed to make this unmistakable four door saloon. The past is the basis for the EB 218. It has the style of a modern car, but the form recalls important design elements of classic Bugatti models, whilst retaining its own character. The result is a uniquely aesthetic body shape with well-balanced proportions. Its characteristics are power and elegance. The model name Bugatti EB 218 refers to the 18-cylinder engine, the first of its kind to be used in a passenger vehicle. This engine, which was developed at Volkswagen, has three rows of 6-cylinder banks which are joined in a "W" form. With a capacity of 6.3 litres, the direct injection engine has an output of 408 kW / 555 bhp at 6,800 rpm and a maximum torque of 650 Newton metres (Nm) at 4,000 rpm. Aluminium space-frame technology has been used for the production of the body. The exterior aluminium cladding is finished in pearlescent "Blu Notte Perlato". The harmonious lines of the body are continued in the comfortable and elegant interior. The instruments are oval in shape and the instrument panel is framed in the finest leather. The interior is further enhanced through the use of light walnut. The special silk-finish leather is in "biscuit" colour. Permanent four-wheel drive and an aluminium multi-link suspension lend the Bugatti EB 218 impressive driving dynamics and excellent traction. The powerful and sporty appearance of the vehicle is underlined by the wide track and the long wheelbase with short body overhang. The Bugatti design can also be seen in the harmonious wheels made from shining magnesium. The Bugatti emblem EB is on the central lock. The vehicle is fitted with eye-catching 285/50 R 18 tyres. Average piston speed at rated engine speed: 17.1 m/sec. So what was already mentioned earlier has come true, the four door version of the EB118 was presented, though the name is not EB122, but EB218. 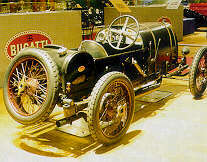 With this Bugatti took a step from the denomination logic of taking the number of years from the birthyear of Ettore Bugatti, which was 1881. 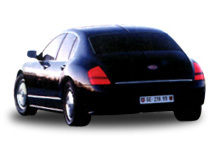 EB118 then was still logic, for a car being presented in 1998, to be marketed (maybe) in 1999. Now we know that the "18" stands for 18 cylinders, and that the 218 is the second - 18 cylinder - car! Apart from this the EB218 is basically a four door version of the EB118, and is closer to this then to the earlier EB112. When these cars are going to be produced is not known of course, but with two cars being presented in so short an interval of time, it is logical for Volkswagen to produce them also. Interesting is that also the new Bentley supersports car was presented. The 16 - cylinder engine is based on the same VR - technology of Volkswagen. The exhibition is in one of the Netherlands´ most famous monuments, the Stock exchange building of 1903, designed by Berlage, which gives a very well-fitting background to the exhibition. January 26, 1999 Bugatti Future ?? Production of the car is unclear at this time. It is possible that VW AG is evaluating the EB 118 for production, or perhaps it is just a design study to help prime the pump. The car evokes Bugatti's heritage and design cues, which VW AG will probably utilize when it begins to market new Bugatti automobiles. The rumored direction of the famous brand would be to position it next to the more conservative Bentley brand as an alternative. The idea here is that the Bentley range will appeal to the more conservative population of northern Europe, while Bugatti will have more of a Mediterranean flare, appealing to southern Europeans with more liberal taste in automotive design. With Bentley and Lamborghini also in the brand portfolio, VW AG is revamping the high end of its platform-sharing policy. Supposedly a plan is being developed for future Bentley and Bugatti models to share underbody architecture, running gear and even engines like the new W18. In the meantime, Volkswagen has begun to update the EB 112 design. This new version of the sedan will be introduced as a concept this coming March at the Geneva Autosalon under the designation EB 122, perhaps intended as a 2003 model if the naming method is consistent. One thing not bought by VW AG, is the now abandoned Bugatti factory in Modena, Italy. Instead of buying the Bugatti factory near VW's Lamborghini facility, rumors suggest that Herr Piech is considering the construction of a new factory in Bugatti's original home of Molsheim, France.